Whenever a computer crashes, you may suffer severe data loss and the data recovery process could be tedious. Even the most stable computer system in the world will experience some kinds of computer breakdown or malfunction from time to time. We all know that prevention is always better than cure. But how many of us really spend time performing data backup periodically? With the announcement of FlashBack adapter from SanDisk, it will eliminate, or at least minimize the risk of important data loss with the advanced backup software known as “Set It and Forget It” system. In terms of hardware support, it utilizes common ExpressCard slot that is capable of supporting high data transmission up to 2.5 Gbps. Good thing here is, the FlashBack adapter is compatible with famous SD (Secure Digital) and even SDHC (Secure Digital High Capacity) memory card for the data to be backup securely. Combining with the intelligent backup and restore software, user will no longer need to worry about forgetting to do the backup periodically. The utility will detect the presence of new files and perform the backup automatically and immediately. Additional features include encryption method that able to prevent data access from unauthorized party. 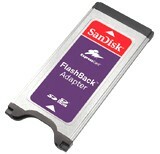 The FlashBack adapter is retailed at $29.99 with the SDHC being sold separately. It does pack with necessary backup software that is compatible with Windows 2000, XP and even Vista. Besides, SanDisk also offers additional online storage with secured data protection at nominal fee. Check out the Sandisk’s announcement.